Beach descriptions courtesy of The Crazy Tourist. Read more: Top 5 Georgia Beaches., Top 5 South Carolina Beaches. With its bustling cities and amazing mountain towns, North Carolina is a state with plenty of sightseeing options. It also features more than 300 miles of coastline to choose from and thousands of waterfront vacation rentals to book. If you are looking for a nice and quiet place for your next summer coastal vacation, the state of North Carolina should definitely be considered as an option. Whether the beaches are picturesque and beautiful, or accessible only by boat, there is something that makes the shores of North Carolina special. Situated on Bogue Banks which is one of the barrier islands of North Carolina, Atlantic Beach is part of the famous North Carolina’s Crystal Coast. It features crystal clear waters and is the perfect place for a family vacation. Atlantic Beach offers a wide range of eateries that should satisfy every traveler. You will find everything from ice cream shops and fast-food joints to glamorous restaurants with 5-course menus. When it comes to shopping, there are a couple of surf shops and several beach boutiques. After spending a day on the beach, check out the North Carolina Aquarium that is located in the center of the island, it’s one of the most popular attractions here. You most likely won’t find many resorts and fancy hotels at Atlantic Beach, just private homes available for rent at affordable prices. Well-known for its wide sandy beaches and deep blue waters, Wrightsville Beach is one of the best beaches in North Carolina and attracts many travelers from all over the U.S. There are 44 public access points to Wrightsville Beach, which means the crowds of visitors usually spread out throughout the stretch, so you won’t be fighting for space. Wrightsville Beach is also a hot spot for kite-boarders and surfers. Even inexperienced surfers can practice their skills here since during the summer season the waves are quite gentle and the waters are shallow. Beware that surfing is strictly forbidden right in front of the lifeguard stands. Nags Head features a classic Outer Banks vibe and is a great spot for anyone who loves spending time at the beach. Expect to find a mixture of beach activities and nearby amusements, including mini-golf courses, go-kart tracks for kids, and dozens of ice cream shops. This pet-friendly beach also attracts many vacationers who like to ride on horseback. 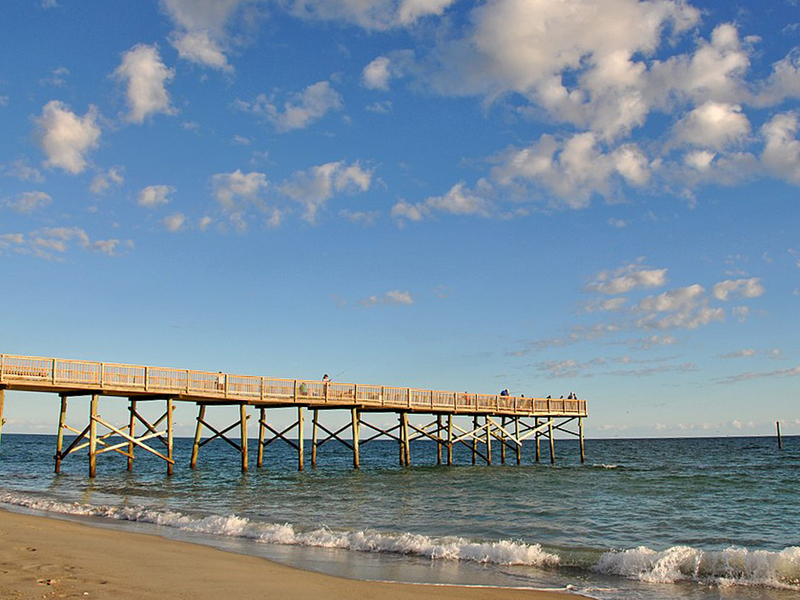 Once you’ve had enough beach time, head out to some of the most popular attractions in the area such as the Jockey’s Ridge State Park that is famous for its scenic hikes, Jeannette’s Pier, or Bodie Island Lighthouse that offers amazing views of the surrounding areas. You will also find a variety of restaurants in the neighborhood that serve BBQ dishes and delicious seafood snacks. One of the most isolated beaches in all of North Carolina, Carova is a perfect destination for adventurous vacationers who are looking to get away from the urban lifestyle and crowded beaches. One of the reasons why Carova is such an isolated place is the fact that there are not many paved roads in the area. The beach is only accessible by 4-wheel drive and there are no restaurants or gas stations nearby. Make sure to stock up on food and essentials, as there are also no large supermarkets here. The actual beaches are extremely clean and the water is warm, especially during the summer season. Carova Beach may not be the best place for families with children due to the lack of amenities and lifeguard stations, but it’s definitely an interesting destination for everyone who likes privacy and loves wildlife. When it comes to accommodation, private rental homes are the only available option. Carolina Beach is located in New Hanover County and features a white-sand shoreline that is just perfect for fishing and surfing. The kids love this place with its variety of rides and games on the boardwalk. The boardwalk also features live music performances, as well as other events throughout the year. If you get bored of sitting in the sun, make sure to check out the nearby Carolina Beach State Park that offers a number of amenities including a marina, several campsites, and hiking trails. There are rare plants to see such as the venus flytrap located in the wetlands area of the park. A couple of restaurants, an ice cream store, and a delicious donut shop are situated on the small strip. The descriptions are reused with permission from the Crazy Tourist's Top 15 North Carolina Beaches article.